Hospitality industry has always been a resourceful field including accommodation and entertainment services, food and beverage, event management and above all customer satisfaction. The restaurant industry has regularly been under the scanner since demonetization. In India this industry is on constant growth and is now under the impact of GST – Goods and service tax. 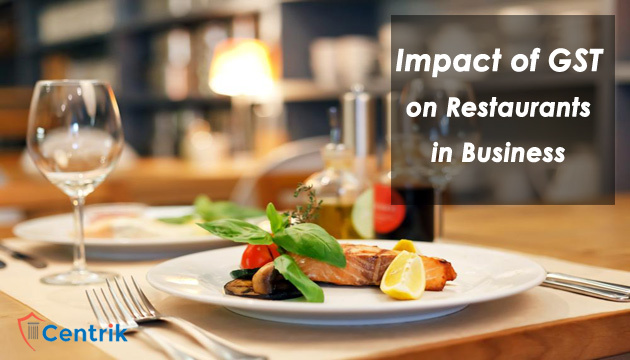 Our goal in this article is to make understand how restaurant food bills will be affected under GST. We will also enlighten the consumer as the amount that has to be paid will also be affected under the same. The Indian Restaurant industry is of worth Rs. 75,000 crores and is developing at a yearly rate of 7%. The business is particularly divided into 1.5 million eating outlets. As per NRAI’s India Food Services Report in 2013 the industry currently employs 4.6 million people which is estimated to grow to 8 million by 2018. The smaller outlets like food courts, dhabas, coffee bars catering large population on daily basis. The people who fall in this business category earn simple income and thus the new tax format is likely to come under criticism. All kinds of hotels whether it is AC or non-AC will collect the higher rate and this will bring an overall hike in price for food items. Step 1: Apply for Registration: Firstly, you need to apply for GST registration in Form GST REG – 01 on the GSTN portal. You would be then asked to upload the documents and sign the same with your digital signature. Step 2: Verification of Documents: Once you submit the application, the department officer will verify your application. If all the documents are found to be authentic, then he/she shall grant you the registration certificate, or else your application might be rejected after giving reasons. Step 3: Grant of Registration Certificate: The department shall grant you the registration certificate. Under GST, the restaurant business is treated equally with any other business. As per the GST rules, 3 monthly returns are required to be filed. GSTR-1 – Outward Return (Sales Return): The first return under GST is the sales return which is required to be filed by 10th of the following month. GSTR-2 – Inward Return (Purchase Return): The second return is filed is before 15th of the following month. 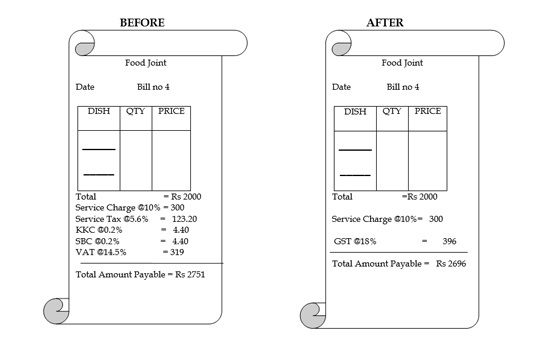 Below we have provided a comparison of how consumer food bill looks pre and post-GST impact. Further, apart from the above three monthly return, GST Annual Return (GSTR-9) has to be filed by 31st December of next Financial year. If we compare, the customer saves Rs 55 on bill post GST impact. The rate of tax in pre GST regime was 20.5% which has come down to 12%.